No board, no cards – just dice! These fast, inexpensive games are all about portable fun. 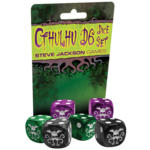 The Cthulhu D6 Dice are stunning dice to use with any game that calls for a d6! 3 to 8 can play. Each game takes 10 to 20 minutes, and can be taught in a single round. It comes in a durable cammo bag – great to take on camping or hunting trips. These custom, double-injected dice accurately resemble a bullet and cartridge, and can replace any standard six-sided dice. 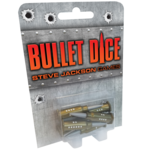 Bullet Dice are the ideal ammunition for a great game night! Fling your snot (dice!) at the Garbage Pail Kids! In Garbage Pail Kids: Super Snot Shots, the more of them you hit with your boogers, the more points you score. But watch out! The other players are also Super Snot Shots and only the grossest player will win the game. Two to four players can play Chupacabra: Survive the Night. Each game takes just 10 to 20 minutes and can be taught in a single round. If you're looking for the dice rolling utility that used to be on this page, it has moved over here.